Sal works with Bussenger Financial Group in designing all of our cases. Sal has vast knowledge in all Life Insurance and Annuity Products and is always searching for that product that will work best for our clients. Sal also assists in preparing our Investment Analysis that we provide to all of our Clients. 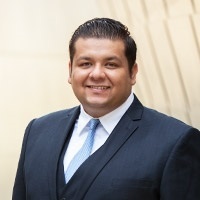 Sal Velazquez specializes in product support which includes all aspects of Life Insurance, LTC Planning and Annuities. Sal and his Team provide Bussenger Financial Group an immediate source for solving the problems our prospects and clients face in preparing a sound retirement plan. Sal has a very extensive and diverse business background. He transitioned out of the medical field, where he worked as a Pharmacist, to become the Finance and Administration Specialist for the nation’s largest pro-bono law firm. He later went on to become the Operations Manager for a driver education company in Los Angeles. He holds a B.S. in Molecular and Cell Biology from UC Berkeley and B.S. in Public Health Administration with a minor in Business Management from the California State University in Northridge. He earned his PharmD from the Western University of Health Sciences. Currently, Sal lives with his wife Victoria and two adorable puppies. In addition to learning about the latest software innovations to improve business practices, he enjoys spending quality time with his family.